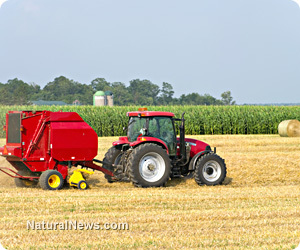 (NaturalNews) The biotech industry, including the likes of DuPont and Monsanto, is taking control of agriculture to a whole new level. Already engaged in controlling farmers' seed and turning crops into genetically modified science experiments, the biotech industry is taking control a step further by installing rigorous monitoring technology on farming equipment. Farmers across the nation are growing uneasy as this technology begins to dictate their way of farming, invading their privacy. When prominent farmers met in Washington for an annual gathering to discuss matters in American agriculture, a very important and shadowy topic came up. Farmers are growing concerned over the emergence of data collection devices built into their farm equipment. Some of the nation's largest seed companies, including the infamous Monsanto, are gathering large swaths of data from sensors installed on tractors. They believe that the sensors can help crop yields by measuring and evaluating soil conditions and seeding rates, among other variables, but some farmers are concerned about privacy issues. The sensors and data collection tools are used to help the corporations give out seed prescriptions. St. Louis-based Monsanto has been expanding its biotech dominance in the past decade, bringing seed prescription services to Illinois, Indiana, Iowa and Minnesota. Their newest seed control programs dictate a precise seeding recipe for each farm's soil type. The seed "prescription" also accounts for disease history and pest evaluation of the area. This brings a question to mind: When did farmers start needing "prescription" seeds? Are today's farmers growing corporate drugs? Ahead of the game, Monsanto recently purchased Precision Planting, a farm equipment manufacturer. They've also acquired Climate Corporation, which is a database analytics firm. Using both firms, Monsanto can take over farm equipment and collect the data they need to achieve their goals. Biotech giant DuPont Pioneer has partnered with farm equipment manufacturer John Deere to provide their "Decision Services" to farmers. These services allow farmers to upload data onto servers, which ultimately feed electronic data prescriptions of seed and fertilizer back to the tractor in the field. Tractors may be built with GPS systems or seed monitoring tablets that allow farmers to download information. In theory, this GPS technology serves as an information dragnet, analyzing raw field data to provide farmers with industry-funded solutions. As the industry hopes to improve yields, their technology puts farmers under the thumb of their corporate solutions. One farmer who brought light to the issue, Nick Guetterman, is debating whether he wants his farm data evaluated by these specialized corporate services. Guetterman farms roughly 10,000 acres of corn and wheat with his father and three brothers in eastern Kansas but is leery about giving such large swaths of information and control to a seed company and an equipment manufacturer. Furthermore, farmers are worried that hackers can gain access to "real time" yield data at harvest time to speculate commodity markets before crop production estimates are projected. Some are worried that certain groups could obtain the information for antagonistic purposes. As the American Farm Bureau gets involved, data could likely be exploited for marketing purposes or used by government agencies to conduct studies. Many farmers don't want such an invasion of privacy to occur. When Kansas farmers spoke with Kansas Representative Lynn Jenkins, they found out that Washington is all for data collection. In an emailed statement, Jenkins said, "Information and data utilization is the way of the future." Jenkins did understand the privacy concerns of farmers and said plainly, "And just as our federal government struggles with privacy concerns through records at the NSA and various health records, so too must we maintain appropriate privacy protection of individuals from corporate [entities]." The Associate Press reported, "This year's trip to Washington was primarily 'an educational effort' to make sure members of Congress know about the data collecting and understand 'the implications of the issue for our farmers and ranchers,' [said] Steve Baccus, an Ottawa County farmer and president of the Kansas Farm Bureau."